Our well trained and licenced staff will do a thorough inspection of your home and property and diagnose the problem. After trapping and removing the unwanted pest from your home or business, we will seal any openings the animals may have found to enter your structure. If you are a gardener, whether you grow vegetables or flowers, you must be familiar with our local woodchucks. Unlike a rabbit, who will nibble at your plants, a woodchuck totally destroys them. Some people have commented that it looked like a lawn mower went through the garden or flowerbed. This picture should give you an idea of what they look like. People also call them gopher, groundhog, and, occasionally, some people refer to them as a hedgehog. Woodchucks live in holes (or burrows) in the ground. They can be 6 feet deep and upwards of 30 feet across. Every year they live there, they dig more tunnels. Around late October/November, they go underground and sleep till around the third week of March. When they emerge, the males go about the business of mating. They locate every female within their area and the courtships last a few days. Then the males return to their dens. Approximately 33 days later, the females give birth to up to 6 young. The young start to emerge from the den around the first week of June. Woodchucks have to fatten up all summer to prepare them for a long winter of hibernation. The young usually leave the mother's territory around mid-July. Many of the young do not survive the first year. Some sources say that 30% of woodchucks die during the hibernation period. Foxes, dogs, hawks, and coyotes prey upon them in the wild. Woodchucks are vegetarians. They eat chickweed and clover, but if things get really bad, they can even eat poison ivy. They prefer beans, broccoli, and certain species of flowers, which is why they are such a problem for gardeners. Besides causing damage to your garden, and eating all your hard work, woodchuck problems can be more severe. Ozark Pest Solutions has seen driveways and walkways collapse. The problem woodchuck digs a tunnel under the blacktop or concrete, and the rain slowly undermines it until it collapses. Here in the Eastern USA, 1 woodchuck may dig 5 or 6 burrows. Any abandoned burrows go to any newcomers (skunks, and rabbits). If they are living under your home (e.g., in a crawlspace), or other building, we remove them by cage trapping. After the problem animals are removed, the building will need to be sealed up in the same manner as for striped skunks. All burrows should also be filled in. Where a garden is involved, an ordinary fence usually doesn't stop them. They will either tunnel under or climb over it. An electric fence may have some deterrent effect upon them though. If they are just living somewhere out in the open, they can still be trapped, but eventually, another woodchuck will find that burrow and move in as well. Even after it is filled in, the burrow apparently has some attraction to any other woodchucks that may be passing through. Many times a maintenance plan is required to keep the problem woodchucks from taking up residence again in the same burrow. The tracks are generally in line, but close together. Sometimes you can see where the animal was dragging its belly on the ground. They walk very close to the ground. Their burrows are generally the size of a man's fist or a little larger in the Midwest. In some other states, burrows are much larger. 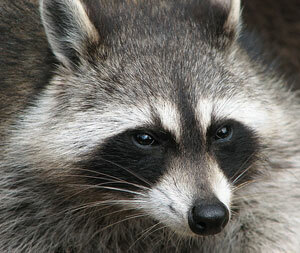 In the Midwest, we have one of the most common causes of conflict with people, the raccoon (Procyon Lotor). They are not rodents, but can still cause problems by nesting in attics, chimneys, under buildings, or decks or inside tool sheds. Raccoons are the primary carrier of rabies here, and so, extreme caution must be exercised if you see one. Stay clear of it! Raccoons generally live in hollow trees in the wild. In suburbia, they will live anywhere that affords them shelter. Chimneys, attics, basements, crawlspaces, tool sheds. Anyplace they can get access to. Unlike squirrels, raccoons will not chew into a structure. They use their hands (similar to humans') to rip vents, soffits, and any loose wood that may be in their way. I have even seen them rip shingles off a roof to gain entry to an attic. Raccoons mate from December to January, and the young are usually born sometime in April. Ozark Pest Solutions has found baby raccoons as early as January, and as late as July. Litters can be anywhere from 1 to 6 young, with 2 to 4 being most common. Raccoons, like skunks, will eat just about anything that is edible. Small rodents, snakes, worms, insects, grubs, fruits, and, of course, garbage, bird seed, and pet food. Raccoons are also notorious for knocking trash barrels over to get at the garbage inside. Raccoons generally start causing problems when they move into a structure. Living inside an attic is common. Although, Ozark Pest Solutions has found them in basements, crawlspaces, chimneys, and garages. There can be odors, risk of disease, and damage to interior ceilings. Chimney dwelling raccoons will make a lot of noise, especially when the young are present. If the flue damper is open in your fireplace, you just may come face to face with one in your living room. Once they are living in a structure, raccoons should be removed and the structure sealed up. Cage traps are used to remove them, and then the exclusion/repairs can be done. Chimney dwelling raccoons can be prevented from ever moving in just by installing a chimney cap on each chimney. Sometimes, both chimney dwelling and attic dwelling raccoons will leave once their young are old enough to walk and climb on their own, generally by mid-summer. Precautions must be taken to prevent their return the next fall, however, or they may move back in when the weather gets cold again. Raccoons have been seen tearing off several shingles attempting to get back into an attic that they previously occupied. The tracks are generally in line, similar to a cat. They appear similar to opossum, which very rarely cause the kinds of problems that raccoons do. You may observe paw prints on your downspouts or deck railings if they are gaining access to your structure this way. In the Midwest, we only have one species of skunk, the striped skunk. Unlike their spotted cousins, striped skunks do not like to climb. They will climb stairs up to a porch or deck to get to food, however. Skunks live underground. They DO NOT hibernate in winter. On the contrary, they mate in Jan-Feb and are very active every night as long as temperatures are favorable. 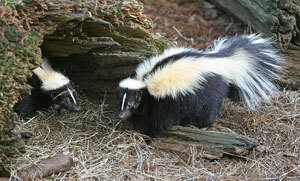 Young skunks are born around April to May, and begin to emerge from the den around mid-June. Up to 13 may be in a litter. The number of young varies from year to year depending on food and denning conditions. In the fall, the young leave their mothers and strike out to find a territory of their own. Later in the season, around December, they start to den up with others, possibly in preparation for the mating season, or maybe just to keep warm. Skunks will eat just about anything that is edible. Small rodents, snakes, worms, insects, grubs, carrion, and, of course, garbage, bird seed, and pet food. Problem skunks are usually nesting under a building in a crawlspace, or under a shed or deck. They will also cause a whole lot of damage to a lawn if grubs are present. Occasionally, they will wander into your garage if the door is left open. They do get rabies, distemper, and can have parasites and diseases. 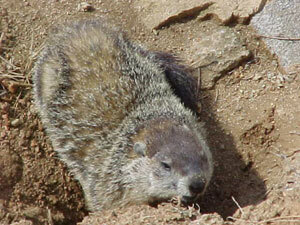 They will also dig under structures to live, or move into an existing woodchuck hole. Unfortunately, in suburbia, their numbers can get so large in a small area that skunk problems will become commonplace in certain neighborhoods. The usual situation is where there are one, two, or a family of skunks living under a building, and the odor becomes intolerable. In these situations, Ozark Pest Solutions will remove the skunks that are living there, with cage traps, and then the entrances need to be closed. Trenching around the perimeter is required, along with the use of a heavy screen (e.g. hardware cloth) to prevent others from digging under the same building. Cridder Rider believes in "remove and exclude". Once the skunks are out, the building perimeter needs to be sealed. Seriously though, there are about 14 different species of snakes in the Midwest. Garter Snakes are the most common cause of conflicts with humans. They usually end up in the basement in spring and fall, and startle you when you go to do the laundry or are looking for something under all that stuff you keep in the basement. They are harmless and usually fall in, or wander in through a crack in a foundation wall, or the space under the door that leads outside. If you can fit your index finger into an opening, chances are a snake can fit through it. CAUTION!! Before attempting to handle ANY snake, make sure you identify it first!! Milk snakes occasionally wander into the basement or house due to the same reasons. They can fit through a small opening as well. Ozark Pest Solutions has found milk snakes to be a little more ornery than garter snakes. You can usually grab a garter snake with a gloved hand, and gently place it outside, seal up the opening and you're done. A milk snake may not be so easy to grab. Always wear gloves when handling any reptile as they may have salmonella bacteria on their skin just waiting to enter your digestive tract. Then you will be sick for a few days with 'food poisoning', or worse. Not to mention that if you try to grab one, it will most likely try to bite you. Their bite is not venomous, but I will not say that it is always harmless either. Snakes don't really do damage, per se, (unless you're bitten) but they are an indicator that you have an opening somewhere in your basement wall, or (most commonly) under the door that allowed them to enter your home. If found in the living areas of the house, most likely they wandered in through an open door. Most of the time Ozark Pest Solutions can just remove the snake, release it outside (possibly at the edge of the property line), and close up the opening or openings through which it may have entered. In the Midwest, it is illegal to translocate any animal. The best thing is to release it in the same area that it was found. There are 14 species of snakes in the Midwest. Four species are endangered, and there are massive fines and possible jail time for destroying or even harassing them. 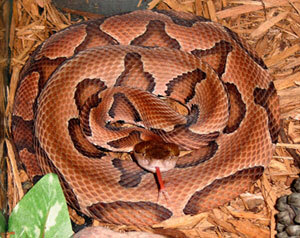 Out of the 14 species, there are two that are venomous-- the timber rattlesnake and the copperhead. Both of these are considered endangered in the Midwest. There are 4 different species of squirrels in the Midwest. Gray Squirrels are the most common cause of conflict with humans (see picture). Occasionally, Flying Squirrels, Red Squirrels, and Chipmunks (ground squirrels) may also cause conflicts with people. 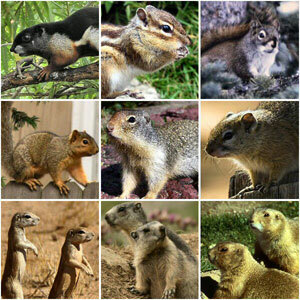 A track of a Gray Squirrel is shown at the bottom of this page. All squirrels are RODENTS (Order=Rodentia). Gray squirrels have at least 2 litters per year. The first in March-April and the second around July-August. Litters can contain anywhere from 1 to 6 young, with 2 to 4 being most common. It is believed that flying squirrels and red squirrels also have 2 litters per year around the same time. Chipmunks only have one litter per year around April, and are so fiercely territorial that they force their young to move out of their territory after about 6-8 weeks. All squirrels will eat mainly nuts, fruits, berries, and seeds. Gray squirrels have been known to eat baby nesting birds as well. The only other squirrel that is carnivorous is the flying Squirrel, which is rarely seen because it is nocturnal. All rodents gnaw. Gray squirrels cause damage just by their chewing. They will chew into attics, and, once inside, can do extensive damage to wiring. They can fall into chimneys and end up in your fireplace, or, if the damper is open, they may end up running around your house. Occasionally, they can be found nesting in a garage as well. Normally, you will hear gray squirrels up inside the attic, or running in the soffits in the early morning (around sunrise), and, again, later in the day (from 4PM till dark). They are generally quiet at night. Red squirrels and Flying Squirrels can be heard scampering around at night. Red Squirrels are more prevalent around conifer (evergreen) trees, whereas you generally find gray squirrels around hardwoods. Both red squirrels and gray squirrels prefer to enter your house from a tree that is close enough to gain access to the roof, but sometimes they will climb a deck or a porch to gain entry to the house, or cross a utility wire. Flying Squirrels can "fly" (or, more accurately glide) from trees as far away as 50 meters or so, depending on the height of the trees. They land on the roof and scamper inside. Chipmunks generally enter from ground level. All squirrels have to leave the building in order to find food. Just a note here, chipmunks will generally enter at the basement or crawl space level of the house, as they nest underground. You can wait till they leave, and then close up the holes. The problems with this method is that between March-May, and July-October, you may trap the young ones inside causing them to die and odors, flies, etc. will be the result. Another problem is that sometimes they will just chew in somewhere else. I believe that the animals causing the problem should always be removed, and then the holes sealed up to prevent others from infesting the structure. We remove them with cage traps and then the entry holes need to be sealed up to prevent new infestations. Ozark Pest Solutions removes all the squirrels, then either close up the openings (at additional cost), or if you have a carpenter or handyman who can do it, then you can opt to do it that way. Just removing the squirrels, and leaving the access holes open is NOT considered to be the complete solution. On older houses, sometimes the repairs can get very expensive.